Reviews and Critiques | Novelist, Roman Payne's "Soliloquies"
Although Payne’s greatest artistic achievements are his novels, he is better known to the world as a poet. Countless works of art have been based on his poems and quotes. The author said that one of the things he loves most about being a novelist/poet is the numerous photos sent to him from people around the world who have tattooed his poetry on their bodies. Payne is a controversial figure in that he is currently exiled in Muslim Morocco where he is forbidden to leave kingdom until he is tried for treason by the king (Mohammed VI). Both the US Congress and State Department have failed so far in obtaining the novelist’s release from Morocco. Payne is spending his days of exile in the souks of the ancient Medina of Marrakech,. Roman Payne is known as an adventurer, and the foremost “novelist on wandering.” His novels and poems are the favorites of other wanderers and world travelers. The forty year-old author spent the first half of his life in America (mostly in Seattle where he was born and raised), while he spent his second 20 years wandering Europe and Africa. He first expatriated to Paris where he lived for fifteen years in the neighborhood of Saint-Germain-des-Prés. The next three years were spent in Athens, Greece; mainland Spain and the Canary Islands. Payne moved to Marrakech in February of 2016 and is currently finishing his sixth novel based on his life there. Although Payne writes in English, his 15 years living in Paris where he spoke entirely in French, has greatly influenced his work, giving it a unique Latinate quality and inimitable voice. The themes of his quotes and prose explore love and sexuality, travel and the life of a wanderer (or wanderess), and the struggle to live, what he calls, “the poetic life.” He is heavily influenced by Homeric Epic, as well as 18th and 19th Century French and European literature. Payne is a beloved writer by feminists and women in general because his inspirational words to women remind them that they too, like men, only have one life to live as far as we know, thus they too deserve to experience every single adventure that life can offer them. He receives a lot of letters from women who write that they found the courage to wander to remote countries after reading quores from him like this one: “Never did the world make a queen of a girl who hides in houses and dreams without travelling” (“Love of Europa”). Will Facebook Win the Next Nobel Prize for Literature? Will Wine Intoxication Ever Become Mandatory for Shepherds? …An Afternoon with Authors Pietros Maneos and Roman Payne. They are both Americans, both highly-literary: Payne is the author of five novels that take place in Europe and follow the lives of itinerant dreamers who wander the world in search of adventure, meaning, and the “poetic life.” Like his characters, Payne, 38, is an itinerant dreamer who lives in Paris, wanders in Europe, and devotes his time to “living the Homeric life,” and “inventing the next novel.” Payne and Maneos are both published by Aesthete Press. 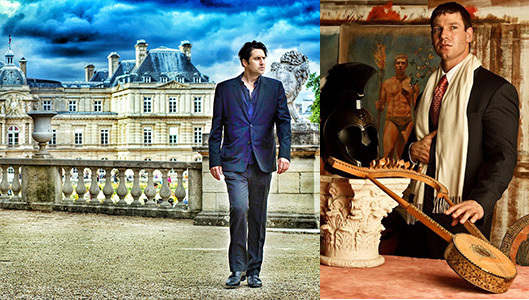 Above, Left: Roman Payne (Photo, copyright 2014: Marta Szczesniak, Photography) | Above, Right: Pietros Maneos. NOTE: SCROLL TO THE BOTTOM OF THE ARTICLE FOR FULL-SIZED PHOTOS OF THE AUTHORS. JEAN SITORI: Roman, speaking of hurling the discus, you just got back from Greece where you were living for about four months… Are you happy to be back in France? Were you writing well in Greece? PAYNE: I am always happy to be back in France—that is why I almost never leave France to begin with. When I get tricked into leaving France, I almost always regret it afterwards. I initially went to Greece this trip to research my next novel at a place on the beach just outside of Athens. But the weather got bad, the sea turned cold and violent—fault of Poseidon! I can deal with nasty weather. But when the inspiration to write disappears, I lose my mind. Here I was in Greece: the birthplace of the muses, and they had abandoned me. I tried all the tricks to get literary inspiration back: yoga, running, hard alcohol, nothing worked. My thoughts were so black that I became convinced that writing was something that was no longer a part of me at all. Now, back in France, I suddenly feel like writing again; and my work is going well. JS: Are you reading at present? PAYNE: No. When I am writing well, I do not read. Reading takes valuable time away, and it puts another man’s or woman’s style in your head to mar your own. What are you reading at present, Jean? Facebook’s founder Mark Zuckerberg told Grazia that he made it his 2015 New Year’s resolution to, quote, “read more literature,” and to finish a book every two weeks. This resolution, he said, inspired him to make reading “chic” (we didn’t know that Zuckerberg had a magic wand for making things chic, but why not?! ), so he has created a Facebook page called “A Year of Books.” It currently has just over 350,000 likes. JS: Pietros, what do you think of Zuckerberg’ public display of affection for reading? JS: Some of the books Zuckerberg said he is reading are excellent titles. Perhaps his publicist thought them up to make the Facebook founder seem complex and interesting, or perhaps he really is interesting. Anyway, many of the titles delve into the Baroque, others into Romanticism, others into Ornate Gothic Style… since your own books are complex and ornate, and explore Baroque Romanticism, do you foresee that pop-culture is going to lean more in your direction and away from current trends, like Philip Roth ? MANEOS: Well, I think popular culture and literary culture are two disparate entities. With regard to popular culture, I think that it is enamored with ‘Fifty Shades of Grey’ and other such works, no? But now transitioning to literary culture, I don’t think that there has been much cultural shift from the irony, cynicism, and anti-aestheticism of the previous epoch. I still think that many writers and artists are busy declaiming ‘Isn’t it pretty to think so?’, while writing in short, spare, suburban sentences. I, of course, have rejected this trend for a Baroque aestheticism that one finds in personages like D’Annunzio and Kazantzakis. I embrace epithet, adjective, apposition and heightened musicality, which are despised by many moderns. So, I certainly consider myself part of a burgeoning counter-culture of To Kalon in modernity along with such movements in the visual arts such as Post-Contemporary. JS: Pietros, just what is it about “Baroque aestheticism” that you embrace? And can you explain the term a little for our readers who have turned a blind eye to that phrase up until now? The great Matthew Arnold once noted, ”The instinct for beauty is served by Greek literature and art as it is served by no other literature and art,’ and I am striving to continue this Hellenic sensibility in the 21st century. JS: Pietros, when one reads your work; or talks to you personally, and listens to your music playlists, one feels that you are more Greek than any full-blood Greek currently alive in Athens, or in Sparta, or Macedonia… How come you didn’t start Bramabella in Greece instead of America? Or at least, why don’t you live six months of the year in North Carolina, and six months of the year in Greece? MANEOS: Well, although I am Greek by descent and sensibility as an ardent student of classical antiquity, I do not speak demotic Greek, so that alone would be a challenge. Additionally, Greece is suffering under dire economic conditions, so if I ventured there, I might end up starving to death, ha! Also, similarly to the orator/philosopher Isocrates, I have always believed that Greece or rather Hellenism is not so much of a language, or a land-mass as it is a world-view, a philosophy, if you will. Figures like Oscar Wilde, John Keats, Percy Bysshe Shelley, Lord Byron, Paul Cartledge, John Boardman and many other Artist/Scholars are as Hellenic as any Greek whose last name happens to end in ‘os’ by happenstance. You too, my friend, are Hellenic even though you were born in America, and have elected to reside abroad. Though, I must make a final confession to you – Traveling to Greece to raise a classicizing army to battle ISIL in Syria-Iraq does intrigue me, as it is perfumed with both Herakleanism and Byronism. JS: Pietros, our poor friend Roman is starting to daydream over there in his chair—one can tell because his eyes look like Lucy in the Heavens with Rhinestones—maybe he is bored because we are so interested in your work right now. 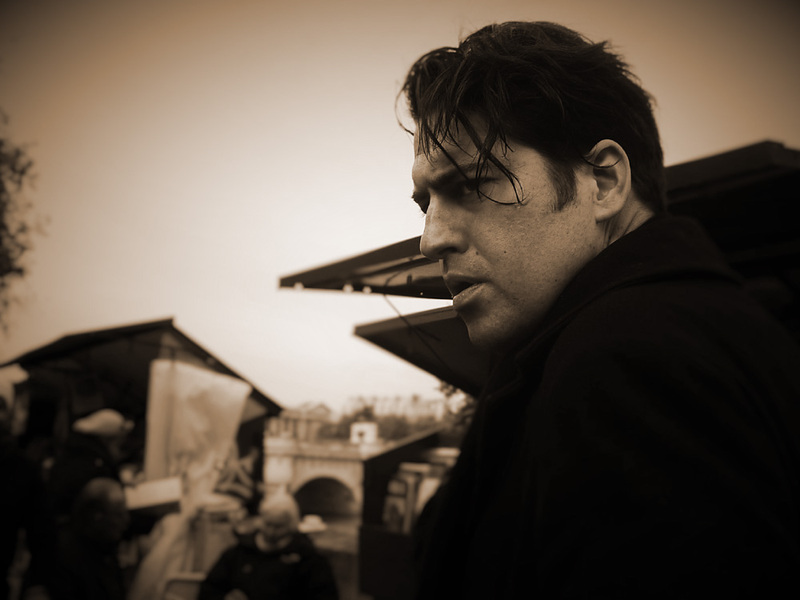 To ask you a question about Roman’s work… His first novel was a Parisian thriller in the Dostoevsky style. His second, Cities and Countries, was a Bildungsroman set in an imaginary world. His third was a tragic love story. His fourth was a diary of seducing women in Paris—everyone from impoverished seamstresses without breeding and a ripe age that can be counted on three hands, to blue-blooded countesses cheating on their husbands. Then his fifth novel, “The Wanderess,” well that is more hard to define. The question is… you, Pietros, are a literary scholar and, if I may flatter you by saying: a literary visionary. What do you think Roman’s sixth novel will be about? What do you think it “should” be about? MANEOS: Roman is a great genius, and I think that for Rooftop Soliloquy and The Wanderess he should be considered for the Nobel Prize, but to speak of your question, I think that he should continue in the Heroic and Aesthetic vein. Perhaps, since he is descended from the ‘Chian Nightingale’ – Homer – in such a pronounced way, he could write a Modern Odyssey akin to what Kazantzakis attempted. MANEOS: Well, I am not sure about a new literary age, but one can only hope! I think that my kinship with figures like Roman Payne, Tomasz Rut, Michael Newberry, Sabin Howard, Graydon Parrish, Michael Imber and others is indicative of a cultural paradigm shift. I am always hesitant to use the term ‘movement’ – but – there is certainly a shared sense of aesthetic values. And one of my aims is to have Bramabella stand as an expression of this aesthetic. JS to PAYNE: Pietros Maneos is a poet, novella scribe, and satirist… he is a writer of many styles, many genres. What is your favorite genre of his at present? PAYNE: Maneos has arrived at a sacred mastery of certain literary forms (I am not fond of the word “genre”). I would say, these “sacred forms” are my favorites of his, since no one does them better than he does. The forms that come to my mind first is what I would call his “Bramabella Pastorales.” In these poems, Maneos is able paint a landscape like Renoir or Monet, construct a exquisite virgin like John Williams Waterhouse, sing of the youthful love of a troubadour, or the old man’s lament of a Cavafy poem. He can prepare the body to fight like a Homeric hero, fall to tears like a Nocturne of Chopin. They are all that is life: his Bramabella poems are the laments of a poet intoxicated with wine, and the joys of a madman sipping the sweet fumes of the poppy. JS: And what is the literary style that you would like to see Maneos work on next? PAYNE: I would love to see him write a 200 page “roman d’amour” in the French tradition… an old style novel about a couple’s first love, and their last. JS: (To the readers)… This concludes our all-too-short interview, but we at Literature Monthly hope to have Maneos and Payne with us again soon! …Don’t they know that writers don’t have checkbooks? …Anyway, thanks to Huffington Post writer, Pietros Maneos, for this cheerful morning. If any of you others reading this want to brighten my day by putting a link to this article on your website, or by just clicking “like” or sending it to a friend, I want to thank you all I can. Send me a note to gift@wanderess.com and I’ll do my best. My good friend, (my close literary friend, Pietros Maneos, a writer and poet of an excellence that competes with the best of the Greeks), just purchased a farm in North Carolina where he will grow in rich soil: saffron, black truffles, grape-vines, even poppies—while he yearns for beauty. “Bramabella” is the name of his farm. It is a portmanteau of two Italian words: to long/yearn for, and beauty). It is strange how we meet friends and acquaintances at turning points in our lives, (so long as we live a dramatic life with dramatic turning points, such are lived by we artists who suffer from ‘the dramatic urge’); so that at the turning point in our lives, we grow closer to some people and lose contact with friends and people we knew before. It was like this when I met Maneos. I was at the time engaged so much in Homer, living in one of the most expensive neighborhoods in Paris and living my own heroic and decadent version of The Odyssey, that classic “Heroic Wanderer’s Tale”. Pietros is a classical scholar, (and Hellenophile, as I am), so our literary aesthetic principals were naturally in accord. At the time, I had just seen the publication of my fourth novel: Rooftop Soliloquy, an ode to sensuality based in part on The Odyssey. …Thus I changed roles in life and begin a phase that was tragic. As a literary man, I am required to be true to who I am in life. I could not write heroically while living tragically. So I changed my literary style to fit my living style. I left a lot of friends behind when I changed cities and changed personalities. People don’t often tolerate a ‘Polytropos’ individual (to use the first adjective in the Odyssey to describe Odysseus). Maneos was my one literary friend who truly showed a literary acceptance of my Polytropos life, an acceptance of people I believe is essential to the great writer of literature. Also Maneos has an excellent talent—I would say better than I have—for defining aesthetic styles, and defining literary genres. He is also an amateur of Romanticism and Oscar Wilde, so he was able to expand our principals of Heroism to include concepts of ‘Suffering’ that are overlooked in Homer. (Recall how the tears of Achilles and the tears of Odysseus on the beach of Calypso are both overlooked when readers neglect to assign these heroes with any weaknesses.) Indeed, in De Profundis, Wilde appears to us to possess a rather weak spirit—though his spirit shows a certain Heroism in suffering. My friendship with Maneos reminds me of the friendship of the Dadaists: Tristan Tzara (one of the very founders of Dadaism) with his friend and literary colleague: the tragic, depressive anti-hero, Jacques Rigaut, who became Tzara’s friend and adopted his movement. I am happy to let Maneos be the master of his Bramabella and use his land to write the artistic/aesthetic Manifesto that will come to define Bramabellaistes. And I would be happy to adopt such a movement as my own, shall I remain Master over my own literary works, letting them twist and shift (‘Polytropos’) according to my dramatic life changes. And so that my literary works help to shape a part of what the Bramabella aesthetic is. It still isn’t completed decided, I think, exactly how Maneos will sculpt his Paradise. Moreover, I believe that today he is successfully living out his dreams for tomorrow. He said that that strolling in Bramabella, he “often [stops] to rest and to simply marvel at the multiplicity of colors of the leaves as they [dance] gently in the branches.”…Thus Maneos has successfully achieved his goal, of living for the moment, in a constant longing for Beauty! INFORMATION: For more details about Bramabella or Pietros Maneos, or to inquire into how you can possibly participate in Bramabella, please email Maneos at: pietrosmaneos@aol.com.